Following successful technology launches over the last three years in augmented reality and virtual reality, the PGA TOUR has unveiled Artificial Intelligence (AI) platforms to enhance broadcast and digital storytelling. Among the TOUR’s primary areas of focus in AI is a Microsoft-developed Content Relevancy Engine (CRE), a smart video clipping tool and an automated story creator that all utilize data captured by ShotLink powered by CDW. An example of PGA TOUR’s usage of artificial intelligence. 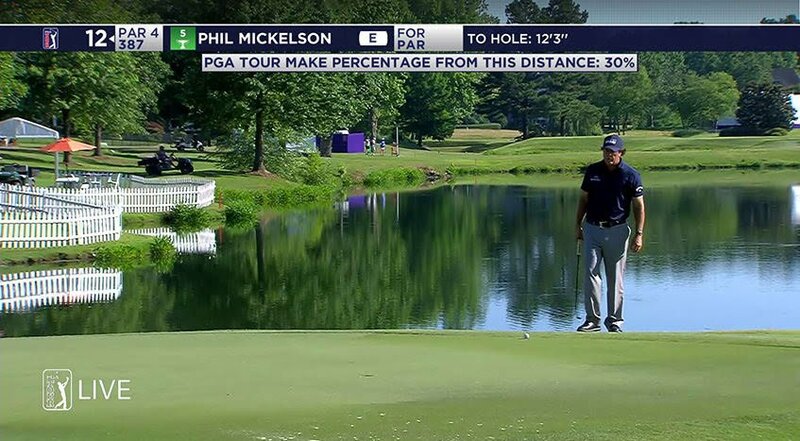 Microsoft has collaborated with the TOUR to develop an application built on Microsoft’s Azure cloud that can sift through nearly 20 years of statistical data collected by the TOUR’s proprietary scoring system, ShotLink powered by CDW, as well as 80,000-plus hours of video in the TOUR’s digital library to provide real-time statistical trends and storylines relevant to the current action. The CRE provides contextual content for television broadcasts and digital properties to enhance fan understanding of competitive situations as they occur. To illustrate CRE, the PGA TOUR will use a recent example of a situation in which it was utilized. At the Memorial Tournament presented by Nationwide in June, Bryson DeChambeau was clinging to the lead in the final round when he missed the green on the par-5, 15th hole, leaving himself 57 feet from the hole. At this point, he was 15 of 19 in Scrambling to lead the field. DeChambeau pitched to within 5 feet of the hole, a distance from which he converted 46 of 50 times for the week. Sure enough, he made the putt to maintain the lead and went on to win his second PGA TOUR title in a playoff. The information above was instantly available to the broadcast team to aid in building suspense as the action was unfolding on the course. Previously, this level of detail would not have been compiled until after the moment had passed. Prior to the CRE, TOUR staff and broadcast teams would spend large amounts of time preparing statistical packages and graphics prior to the round that often went unused if the anticipated scenario didn’t play out. Working with WSC Sports, the TOUR is now using their AI driven smart video generation platform to analyze TOUR broadcast video along with data from ShotLink to generate content for all PGA TOUR digital platforms. Within minutes, the video generation platform creates a variety of highlights including a five-minute video package of a player’s round, a task that previously took hours to produce and post to digital platforms. The TOUR will continue to work with WSC to grow this service to provide a wide variety of video content including specific highlight packages of players from selected countries for distribution to partners around the world. “Streamlining video generation workflows using WSC’s advanced technology will help keep our fans engaged, enhance audiences’ digital experience on any digital platform, and expand the TOUR’s global reach,” says Scott Gutterman, VP Digital Operations at the PGA TOUR. The TOUR leveraged Narrative Science’s NLG platform, Quill, to automatically write round recaps customized for every player in the field following every round of a tournament. Quill transforms the player’s most recent and pertinent performance stats into insightful recaps available on PGATOUR.COM or for fans using an internet search engine.